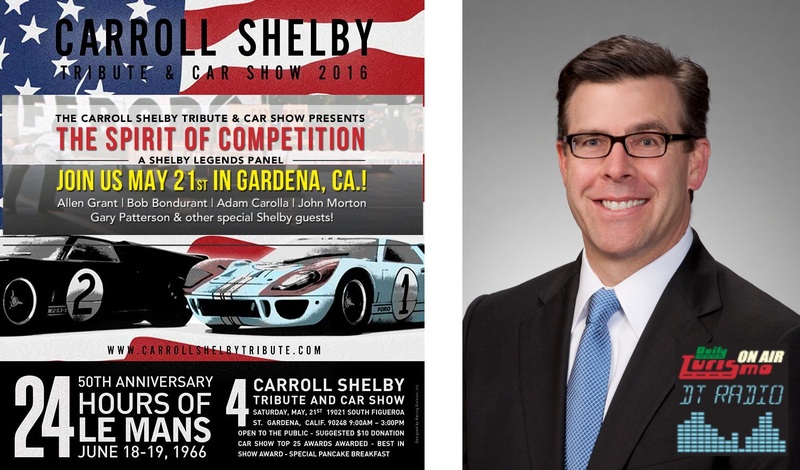 This is an exciting week to be a Shelby fan -- starting with the 4th Annual Carroll Shelby Tribute and Car Show 2016 on Saturday May 21st 9AM-3PM in Gardena, CA, which has been a fantastic show since it was launched in 2013. To get the inside scoop on what's going at the event this year, we've got Aaron Shelby joining us for this Friday's episode of the Daily Turismo Radio Show. Aaron is Carroll Shelby's grandson and a board member of Carroll Shelby International, Inc -- we are very excited to get him on the show to talk all things Shelby. Listen live tomorrow on TalkRadioOne.com or via Tunein radio app for your phone (and search TalkRadioOne) at 7PM Pacific time (10PM Eastern) May 20th or anytime on PodBean or iTunes. The festivities at this year's Shelby Tribute show include a "Spirit of the Competition" panel with Allen Grant, Bob Bondurant, Adam Carolla, John Morton, and Gary Patterson at 12noon to celebrate the 50th anniversary of the '66 24 Hours of LeMans. Be ready to make some noise during the Shelby engine rev at 1PM -- for more info head over to carrollshelbytribute.com or the facebook page.